Bruce Conner, ‘Tracery in the Sky (detail)’, 2002, archival pigmented inkjet with graphite. Image courtesy of Magnolia Editions. one medium for long, and infamously shifted personas, often attributing his artwork to celebrities, such as actor and friend Dennis Hopper, and fake personas alike. Printmaking is one medium that spans Conner’s entire career. This exhibit features around 100 works, from the first etchings and lithographs the artist made while still a young student in Kansas in 1944 to his last inkjet prints made with Photoshop at Magnolia Editions, Oakland, California, in 2003. The ICA is hosting an art talk featuring in-depth discussions of Bruce Conner’s work and the cultural landscape that influenced him. The public is invited on Thursday, April 16 at 7pm. Admission is $10. The ICA is located at 560 South First Street in San Jose. 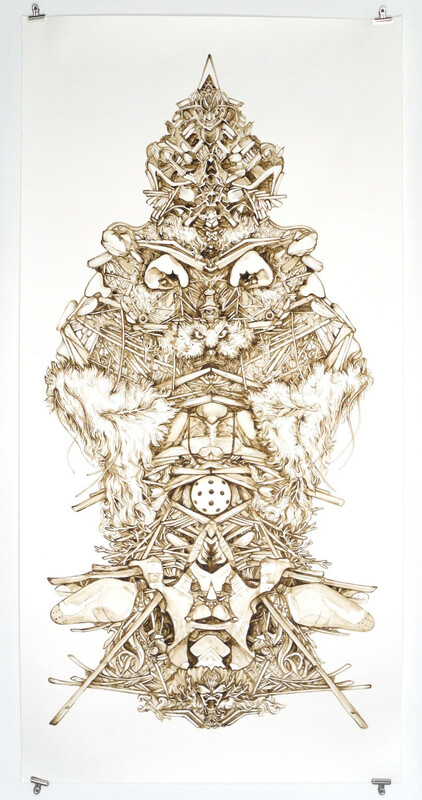 Tanja Geis ‘Littoral Daemon I’ 2014, mud from San Francisco Bay on paper. Image courtesy of Embark Gallery. Friday April 10, 6-8pm – What Grows Here, at Embark Gallery: In February 2015, Embark Gallery opened at Fort Mason Center. A non-profit art space that provides exhibition opportunities to graduate students in Fine Arts in the San Francisco Bay Area, Embark Gallery fosters an environment for an engaged community of artists, curators and scholars, and expands the audience for up and coming contemporary art. The gallery represents the diversity of the talented artists studying at seven local art institutions including California College of the Arts, Mills College, San Francisco Art Institute, San Francisco State University, San Jose State University, Stanford University, and University of California, Berkeley. Opening on April 10th, What Grows Here, will be on view until May 25, 2015. For this exhibition, artists were asked to submit works that engage with the exhibition Fertile Ground: Art and Community in California (on view through April 12) at the Oakland Museum—artwork as diverse as California itself. Topics include local or personal histories, California style, past or current political issues, and art that engages with contemporary California culture. Embark Gallery is located at Fort Mason Center, Building B, Suite 300. Welcome to Headlands Center for the Arts from Headlands Center for the Arts on Vimeo. Sunday April 19th, 12-5pm – Spring Open House at the Headlands Center for the Arts: Headlands Center for the Arts is a multidisciplinary, international arts center dedicated to supporting artists; the creative process; and the development of new, innovative ideas and artwork. Located in a cluster of artist-rehabilitated military buildings, just north of the Golden Gate Bridge they open up all of the artist studios twice a year for an open house. Visitors can roam the various buildings of the campus, engage with artists in their studios, experience new work and works in progress, see performances and hear readings. On top of all that The Mess Hall cafe will be open serving lunch. Headlands Center for the Arts is located at Fort Barry in the Marin Headlands. 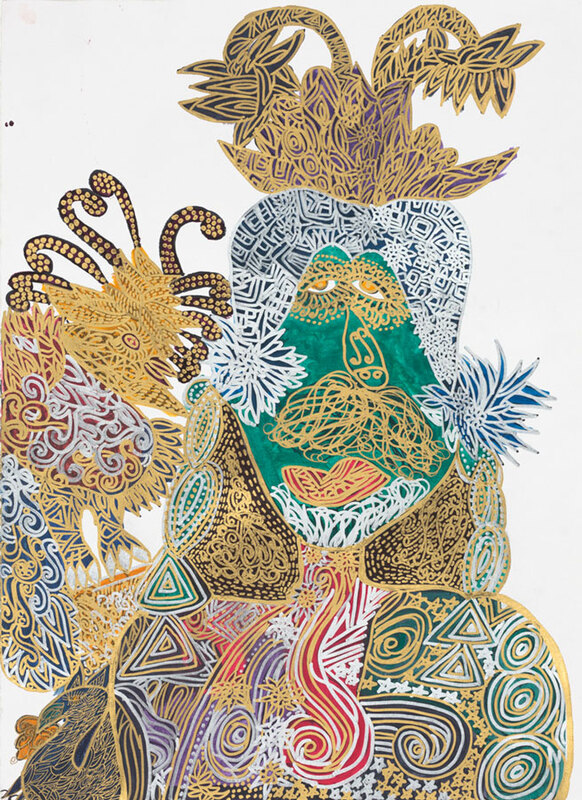 Christina Marie Fong ‘King African Statue’ metallic ink on paper. Image courtesy of Creativity Explored. Thursday April 23rd, 6 – 10pm – Art Changes Lives annual celebration to benefit Creativity Explored: Creativity Explored provides artists with developmental disabilities the means to create, exhibit, and sell their art in studios and a gallery, and around the world. This event will be held at the Four Seasons Hotel, 757 Market Street, click here to purchase tickets. 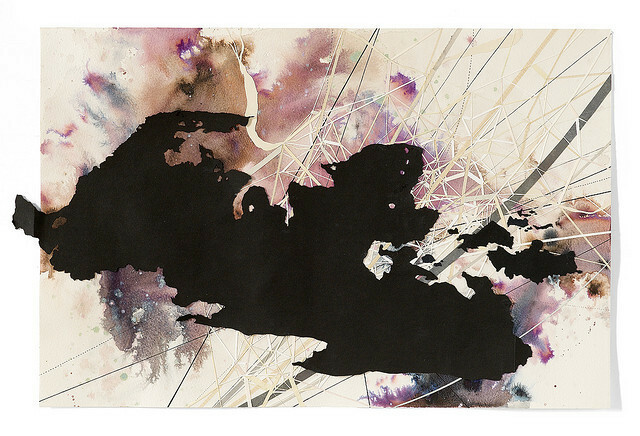 Val Britton ‘Northwest Territory’ 2010, ink, graphite and collage on paper. Image courtesy of KALA Art Institute. Saturday April 25th, 6:30 – 10pm – Fresh & Local, Kala Art Institute’s Spring Auction: Kala Art Institute’s mission is to help artists sustain their creative work over time through its Artist-in- Residence and Fellowship Programs, and to engage the community through exhibitions, public programs and education. This year their auction features artworks by over 100 talented artists, and unique art-related items, local treasures, and experiences offered through both live and silent auctions. Fresh & Local will be held at Meyer Sound Laboratories in Berkeley. To purchase tickets click here. 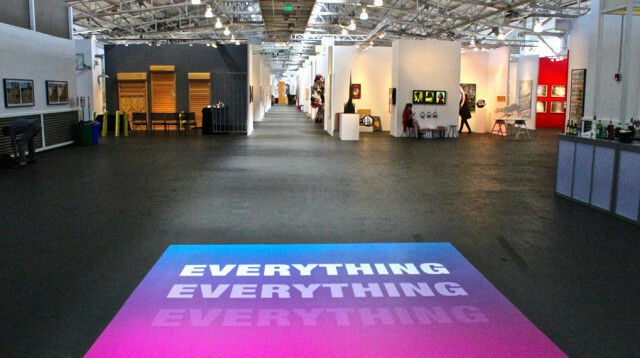 April 29 – May 3rd, Art Market San Francisco: This is the fifth edition of this modern and contemporary art fair. Featuring approximately 70 galleries from around the country, innovative programming, performances and installations. The VIP Preview party benefits the Fine Arts Museums of San Francisco comprised of the de Young and the Legion of Honor Museums. Art Market San Francisco is located to Fort Mason Center. To purchase tickets click here. May 1st – 3rd, Start Up Art Fair: This is the inaugural year of this independent art fair for unrepresented artists. 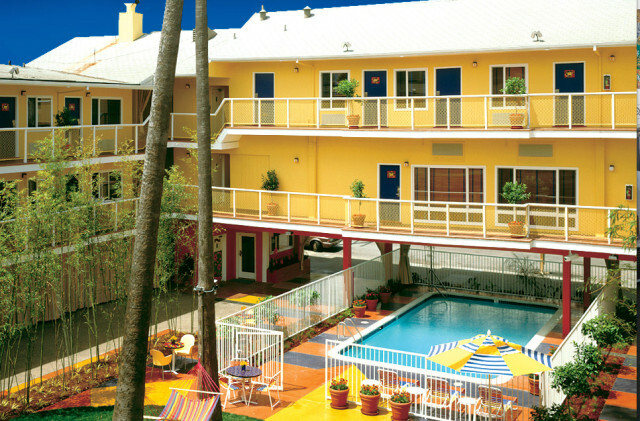 Located in Hotel Del Sol in the Marina District, over 40 artists will present solo exhibitions in hotel rooms. Collectors can acquire great works of art directly from the artists, making real connections in an intimate setting. To purchase tickets click here.